This property was first listed in 1884 as the property of John Fogarty who owned and operated a railroad contractor company. However records of the first occupants were listed as renters Joseph and Mary Smith. The current home was constructed c. 1910 by Walter and Lucy Parkins and is a fine example of an arts and crafts style home. The interior still boasts the original pantry, woodwork and light fixtures. Walter Parkins first came to Dakota Territory in 1884. He served as Indian Trader at Fort Yates from 1889 -1903 and was later appointed as a livestock purchasing agent on the Standing Rock Reservation. A rancher himself, he owned the north half of section 5, township 135N range 80W as well as the entire section 29 in township 136N range 80W. He served on the Board of Directors of the Merchants National Bank of Mandan including as Vice President at his death in 1914. Upon his passing, his wife Lucy took in renters including a young lawyer named Charles Cooley. He met and fell in love with the Parkins’ daughter Ruth. Charles Cooley and Ruth Parkins were married 1919 and remained in the home with Ruth’s mother. Mr. Cooley served as Mandan City Commissioner for 8 years starting in 1928. He was instrumental in assuring a replacement building was constructed when the Mandan City Hall burned down the night after his first city commission meeting. Today, we refer to this replacement building as the downtown Fire Station. Mr. Cooley was also appointed to various civic advisory and state-wide boards. He also served on the Board of Directors of the First National Bank for 22 years. 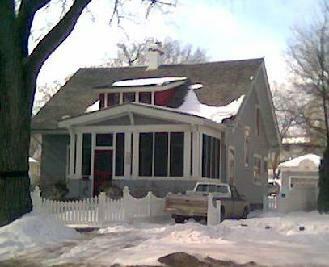 The ownership of the home passed to the Cooley's in 1938 upon the death of Lucy Parkins. Charles Cooley remained in the home until 1959 until his death. His widow Ruth continued to live in the home until 1981.